Please join us on Dec. 4th for our year-end party! We will update you on all of our work, tell you what happened this year, and what’s going to happen next year with our almost-15 year fight against the Northern Integrated Supply Project. In addition, our guest speaker will be former Fort Collins City Councilmember and Sierra Club Raconteur Alan Apt who has a new book out. Published by the Colorado Mountain Club and titled, Ski and Snowshoe Routes on Colorado’s Front Range, the book describes and maps the best routes all along the Front Range mountains all within easy driving distance of Larimer County. 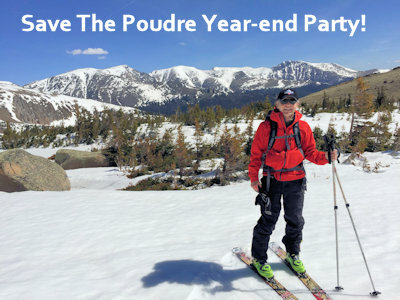 Alan will also generously donate a portion of book sales to Save The Poudre at the event! Alan has a great slideshow, and his book might make a perfect holiday gift for a snow-loving friend or family member.